Recently we have read about 7 must financial products for retirement planning; today we will discuss advantage and disadvantage of stock and real estate investment and how these assets can rock your retirement. Stock and real estate investment is risky affair and very few people participate in these two assets but believe me these two assets can rock your retirement by providing highest returns. Let me share real life example my friend has purchased 100 shares of Infosys in 1995 through IPO. Total investment done by him was 9500 Rs/-. With multiple split and bonus announcement today he is holding 12,800 infosys shares worth 4 Cr. (dividend extra). With this amount he is likely to live his retirement life easily. Similar to this we have enough examples in stock market starting from Warren Buffet to Rakesh Jhunjhunwala who made their fortune because of stock market. Similarly in real estate you will find names like Donald Trump and Hirnandani who made their fortune. 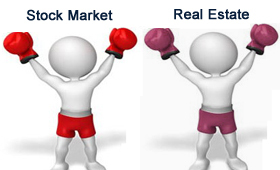 Before you start investing in stock market and real estate let’s look at advantage and disadvantage of both. High liquidity:- Stock market investment offers good liquidity. You can quickly get into, and quickly get out of it. Easy Entry:- It just take minute to invest in stock market however good amount of homework is required before investing in stock market. Capital Appreciation: – You can expect capital appreciation from good stock in shorter time. Tax Advantage:- Dividend income from stock is tax free and if you hold stock for longer duration capital gain from stock is also tax free. No Control:- You have no control over stock market ups and down. High Risk:- Stock investment is risky in nature you may end up by making loss. Volatility:- Stock prices can rise and fall dramatically, especially in uncertain economic times. Real estate investment means buying property like land, apartment, flat, commercial property etc. Appreciation:- If you manage the property well, your rents income increase. Over the period property rate will also appreciate. Tax Advantage:- If you purchase home and take home loan you can enjoy tax benefit on principal and interest payments. Not Liquid:- It is not so easy toget in and out of real estate. Sometime you may able to purchase it quickly but unable to sale for longer duration. Expensive:- Real estate investment is expensive and sometime it is difficult to arrange for money at single shot. Black Money:– Black money is involved in almost every real estate transaction sometime it becomes difficult to deal with black money and arrange black money. Due diligence & time lag:– You need to undergo due diligence or inspection before purchasing property which may take time. Investment in stock market and real estate will rock your retirement you must invest in it. I hope above article will help you while investing in stock market and real estate. Be generous to share this post!